7 Square is the first restaurant created by Alvaro Perez’s Tokyo-based restaurant production company, Metromet. Located at the Time Hotel at 224 West 49th Street in Times Square, 7Square (whose name was derived from the street address; 7 is the square root of 49) will be a modern chophouse serving modern American fare. The restaurant will serve lunch and dinner, and the official opening is set for September 18th. The restaurant’s name isn’t the only play on mathematics; the menu also includes Ham2, which is a delicious dish of artisan hams presented 4 ways. Other dishes that seemed to please everyone at a recent pre-opening tasting dinner included the 7Square Caeser Salad (shredded lettuce on crusty croutons with a poached egg and bacon strips), Dirty Rice Risotto (duck confit smoked duck ham foie gras and green onion), and chef Shane McBrides’s signature Root Beer Braised Short Ribs with fork crushed parsnips. 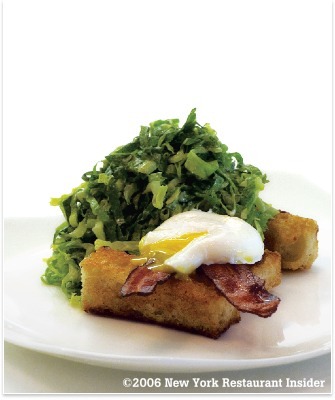 Chef McBride will rotate an array of side dishes based on seasonality. McBride, whose pedigree includes Chef Charlie Palmer and Lespinasse with Chef Christian Delouvrier, has also shown his handiwork with the wine list, creating an All-American list consisting of boutique and well-known choices. The space, which had recently been Oceo restaurant, was designed by architect Glen Coben (Sascha, Del Posto), who used curved walnut panels to create intimate pod-like dining areas within the larger space. Russian born artist Alexander Kaletski, who is known for collages of humorous figures on cardboard, created five one-of-a-kind pieces using various wine boxes from the restaurant’s wine list as background. Alvaro’s chophouse concept is perfect for Times Square, which has one of the most diverse clienteles of any neighborhood in Manhattan. 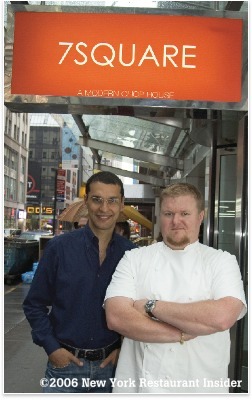 Restaurant Insider got the inside scoop on 7Square from Mr. Perez and Chef McBride. Q: How did a Venezuelan with roots in Italy and LA became so involved in the culinary scene in Japan? A: I wanted to be an artist, and after going to school in Italy I went to L.A. While going to school I started working as a waiter at Il Forno in Santa Monica and I really enjoyed the contact with people. A Japanese corporation wanted to open Il Forno in Tokyo, and I went for one year to help open the place. I stayed for fifteen years and got more involved in the restaurant industry there, and opened Metromet (Metropolitan Gourmet), my restaurant production company. We do concept development, consulting, management training and on-going staffing and training. 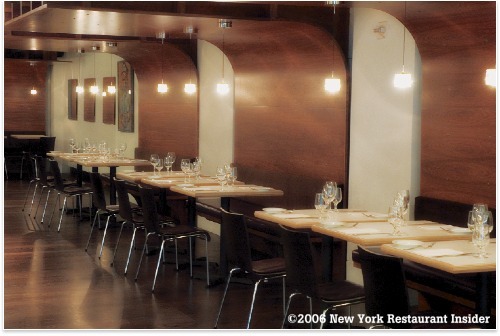 Q: I understand this restaurant is a collaboration between yourself and others including Hall PR and designer Glen Coben. Can you describe what your goals are in this collaboration? A: There is enormous potential to create a bridge between Tokyo and New York. My vision was to put a 100% New York group together who can develop projects in both countries. 7SQUARE is the first project, and we are already negotiating some other projects. We are also helping Japanese restaurateurs who want to open in New York but don’t have the connections here to get things done. Q: Besides the partnership, what makes this restaurant unique? Will you be opening 7Square restaurants in other locations? A: 7SQUARE is our window to Japan. Steven Hall’s office in Tokyo is in charge of promoting the restaurant there, and Glen created a design that is modern, warm and very New York. Eventually our idea is to bring a piece of New York to Tokyo with originality. Food-wise, Shane McBride is using 100% American seasonal products, and the idea is back to basics; creating a menu that you can eat anytime. Q: What did you desire from Mr. Coben when you began planning the dining room and the kitchen? A: A modern chophouse. Glen came up with a unique, modern, warm design that is very New York. I believe the team (Steven, Glen and Shane) knew what we wanted and I am very pleased with the results. This is a very straight-forward concept, simple and creative food, and unpretentious service focusing on details. We knew we had a wide variety of people in the neighborhood to feed with many different tastes. 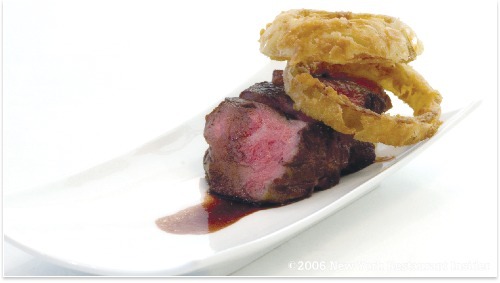 We believe that 7Square will speak to everyone and have enough creativity on the menu to keep the foodie crowd happy. Q: Who would you consider your primary mentor, and what did you learn from working with chefs such as Charlie Palmer and Christian DeLouvier? A: I look to so many people as mentors, the first being my mom who is a very hard working tough businesswoman. She inspires my drive and my work ethic. Christian DeLouvier definitely took me and my cooking to a very high level. He is the hardest working chef I have worked for and is so passionate about food. It was always a pleasure to see him happy when things were done just right. What I took from Charlie Palmer was how to extract as much as possible from your staff and restaurant; how to pick the right people for the jobs at hand, and how to grow a brand name from those people. Ed Brown has also influenced me greatly over the years and has always given me invaluable advice. Q: How has your upbringing in the Southern U.S. influenced your cuisine? A: Southern food to me is about pure flavors and how to make cheap food taste amazing. It’s all about being patient and waiting for flavors to develop. It’s about what great fried chicken can make a person do. It’s about what smoke can do to a piece of pork that people will drive hundreds of miles for. It’s my Grandma’s cooking. Q: Did you create the menu at 7Square yourself or did you have collaborators? A: The menu is me thru and thru, but after I write the menu I always bounce it around with my sous chef Eric Milley. He has a completely different style of cooking and looks at things in a different way that sometimes adds something special to the food. Q: Can you describe some of the dishes that you feel will be the most popular? A: I really like the root beer braised short rib, the sweet salty fat mix is great. We are having fun with things like the Caesar salad and steak tartar.The Ham2 is fun too, I’ve gone out and found some awesome hams from down south. Q: What ingredients, flavors, or dishes in general are completely different from what you have cooked in the past, at Oceo? A: I’m cooking completely different then before; kind of back to basics really, concentrating on flavor and simple plate presentation. I’m having fun and it feels good to step out from the serious kitchen and play around with food. Looking for all-American products has been great too, there are amazing products out there made in the USA olive oils, caviar, cheeses, not to mention the small distilleries we found. Q: Anything else you want your peers to know with regard to the 7Square kitchen or the food? A: I really have gotten in to how things are farmed and how scary the Agri-business is. I want to have things on my menu that are real. I want my cows to have eaten grass the way they are meant to, not force fed corn and chemicals. I want pigs that have fat in them not the ones bred to be fat free and flavorless. I want vegetables that are grown with natural fertilizers - animal poop - not chemically altered sewage. I can only hope that my customers agree and will embrace my restaurant for going out and getting them those foods.